Park design, regulation, and the Occupy protests. which patch of grass or concrete to take over in solidarity with those who were camping out on Wall Street. For many, the answer was obvious. Most cities have traditional protest spaces, like a central downtown square or the grounds in front of city hall such as Frank Ogawa Plaza in Oakland, California. In Washington, D.C., as in New York, protesters camped out at sites with symbolic importance. The choice of D.C.’s Freedom Plaza was a reference to Cairo’s Tahrir Square—which means liberation square in Arabic—ground zero of the Arab Spring. And McPherson Square, another Occupy campsite, is on K Street, which is lined with lobbying firms. Decisions about where to protest were often accidental. Occupy Wall Street had initially planned to take over the space around the bull statue in front of One Chase Manhattan Plaza but failed to secure a permit, so police fenced off the space before the group could move in. Protesters settled on nearby Zuccotti Park, which, because it was a privately owned public space, did not require the large group of protesters to obtain a permit. Occupy Atlanta took over Woodruff Park because a sympathetic group, the Georgia Peace and Justice Coalition, happened to have a permit for the space on the 10th anniversary of the war in Afghanistan. The regulations and design characteristics that would recommend these spaces for long-term occupation were afterthoughts. But to some extent, design and rules were destiny. The parks’ amenities had a major effect on how well the temporary residential communities were able to manage themselves, considering the spotty availability of public restrooms, power outlets, and public trash cans. And when law enforcement ultimately took action, court battles came down to public ordinances particular to each space and the provisions of permits for those who had obtained them. It’s hard to imagine the indignados in Spain, or the masses of the Arab Spring, quibbling over the technicalities of what was and wasn’t allowed in a certain open space. “Nobody is writing an article saying, ‘Do they have a permit to be in Tahrir Square?’” observes Mara Verheyden-Hilliard, the director of the Partnership for Civil Justice Fund, who has coordinated the legal response to Occupy evictions through the National Lawyers Guild’s Mass Defense Committee. The conditions for the protests in Egypt were very different, though. The constitution in Egypt was supposed to preserve freedom of speech, but in practice, journalists and bloggers who dared to criticize the government were often beaten or harassed by police. For 30 years, elections had been rigged in favor of the sitting government, so there was no democratic mechanism for changing the country’s leadership or laws. protesters would be free to get their message out. Some cities where leaders sympathized with protesters even allowed them to break posted rules where they interfered with freedom of speech. At a certain point, though, many public officials had to answer a difficult question: Is one group’s right to free speech infringing upon the general public’s ability to use land that belongs to them, too—either because tents themselves simply took up space that could’ve been used for other things, or because conditions had deteriorated to a point where nobody wanted to use the park anymore? If the answer was yes, they sought a way to dislodge the encampment—sometimes through the creation of new laws. As the months dragged on, even permissive cities accustomed to protest eventually ousted their occupations. No one ever questioned the protesters’ right to assemble peacefully and state their grievances in public. But debates raged over where people could assemble and for how long. By the spring of this year, many municipalities had concluded that freedom of speech does not mean freedom to occupy indefinitely. The idea of occupation as protest—or, at least, camping out during a protest—isn’t new. For nearly three months in 1932, thousands of World War I veterans calling themselves the Bonus Marchers set up camp in Washington, on flats across the Anacostia River from the federal core, massing at the Capitol building to demand early payment of a bonus that they weren’t supposed to be able to claim until 1945. During that same decade, some 400,000 workers staged sit-down strikes, shutting down the factories and ports where they worked, in support of the right to organize in unions. In the most famous of these, at the General Motors plant in Flint, Michigan, the United Auto Workers won the first nationwide exclusive collective bargaining agreement in the United States. In the wake of Martin Luther King Jr.’s death in 1968, the Southern Christian Leadership Conference brought thousands of poor people to camp out on the National Mall, in hopes of making the desperate straits of poverty in the South obvious to lawmakers. The settlement, called Resurrection City, grew to 2,800 people living in plywood shacks, as the ground grew increasingly soggy. After five weeks, police said someone had thrown a Molotov cocktail at them from within the camp and proceeded to clear everyone out. Like the residents of Resurrection City, Occupy Wall Street protesters didn’t have one specific policy goal. Most Occupy groups resisted drawing up lists of demands, instead expressing general opposition to the overconcentration of power and wealth in the hands of a few, and often taking up the causes of the activist communities around them. That meant there was also no obvious end point—systemic inequality doesn’t go away within a few months. societies, however, started to look like the segregated, conflicted world outside. In Los Angeles, 1,000 people settled on an acre and a half around city hall between October 1, 2011, and their eviction at the end of November. The park slopes upward, and the higher ground was more desirable; those in the lowlands dug moats and trenches as a kind of ad hoc stormwater management. The group did its best to maintain paths through the tents to preserve public access, even laying down ramps for those who needed them. But the population within the park swelled to the point where its former uses couldn’t be accommodated, officials said. Its farmers market had to move across the street. Social groups broke off into “tribes” that started essentially privatizing space within the public park, arranging their tents in inward-facing circles. “If you didn’t know people in that tribe, you couldn’t just walk through that section of the park,” says Joan Donovan, one of the organizers. “People would ask, ‘Who are you looking for?’ It became owned space.” The General Assembly of Occupy D.C. in Freedom Plaza actually evicted one woman who tried to create a “women-only” zone. The assembly informed the woman that she didn’t have the right to exclude anyone from the area around her. There were other ways in which elements within Occupy’s encampments closed off the space to the public, through sound and smell. At Zuccotti Park, despite the General Assembly’s attempts to mediate with the neighbors, a rogue group of drummers banged away until late at night. This wouldn’t have been as much of a problem years ago, but the Financial District had drawn thousands of residents and families over the past decade. In Nashville, Tennessee, officials complained of having to scrub doorways and stairwells at War Memorial Plaza every day because of human waste. Despite a desire for self-sufficiency, the occupiers had to depend on resources outside the boundaries of their domains. Public restrooms are scarce, and portable toilets are expensive, so occupiers made heavy use of surrounding businesses. They also needed electricity. Wall Street’s Zuccotti Park has power outlets, which allowed for the near-constant creation and broadcasting of electronic media—but many other Occupy groups had to charge up in nearby buildings or bring in generators to power their computers. The occupied spaces spawned their own municipal governments and newspapers. And they served as base camps for activities throughout the city, such as testifying at city hall—as well as slightly more illegal projects. In partnership with local homeless activists, for example, Occupy D.C. broke into a historic school that had been a shelter until the city closed it and put it out to bid for private developers. The point, protesters said, was that the building was still perfectly habitable and shouldn’t be shuttered while people nearby were going without shelter. For protesters in many cities, establishing any sort of occupation required breaking the law. Most municipal, national, and privately owned parks have ordinances that regulate the ways the parks are used. These ordinances may prevent activities such as obstructing the public right-of-way, staying overnight, holding unpermitted concerts, using heat for cooking, or erecting temporary structures. Many of those regulations had nothing to do with protest—they were instituted to deter vagrants. In 2009, the National Coalition for the Homeless found that 33 percent of 235 cities surveyed prohibited “camping” in some public spaces and 30 percent prohibited sitting or lying down “in certain public places” (such as public sidewalks). Transgression happened one of two ways: either accidentally, when a few individuals broke a rule and others followed suit, or deliberately, with at least a modicum of group consensus. Occupy Wall Street had set a loose precedent for communal decision making through nightly general assemblies, and the group would decide whether bringing in forbidden amenities would be worth the risk of provocation. Occupy D.C. even had its own internal police force, called “de-escalation,” that tried to enforce community rules against violence and hard drug use—with varying degrees of success. Other governments initially let the regulations slide—especially when politicians identified with Occupy’s message. In Los Angeles, where hundreds of people camped out on the lawn in front of city hall, the city council even went so far as to pass a resolution in support of the occupation. With few hard and fast rules during those ambiguous stretches when the protesters were relying on officials’ leniency, city governments and their occupations entered a continuous negotiation over what would be allowed and what wouldn’t. In Oakland, occupiers in Frank Ogawa Plaza were asked to respect a historic oak tree in the park after officials worried it might be harmed by ropes tied around it. In Denver, occupiers were asked to remove their belongings from the sidewalks. In Washington, the National Park Service (NPS) allowed camping in McPherson Square for months but kiboshed the construction of a large “barn” made out of plywood and two-by-fours. The city’s willingness to bend rules for protesters, at least temporarily, led to some resentment from the homeless residents who had been rousted from their park benches in the past. Most settled into an uneasy equilibrium, with the occupiers offering food and safety in numbers. 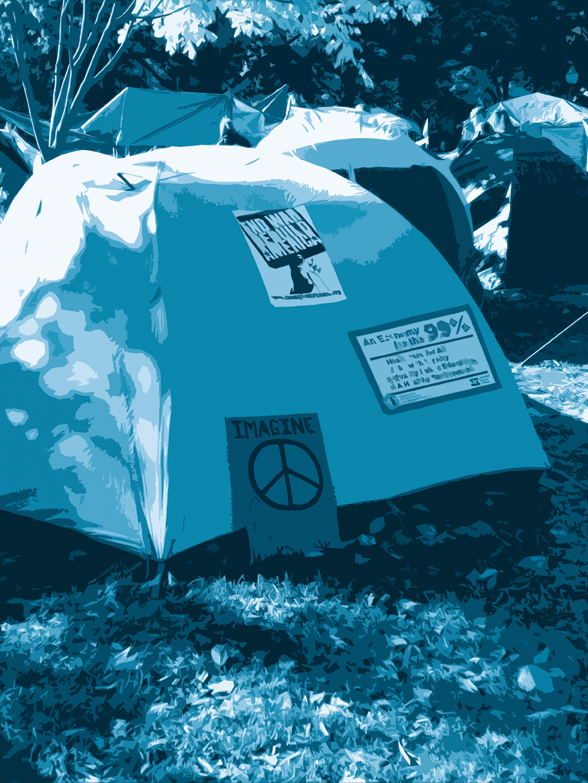 At the same time, however, Occupy camps ran the risk of being seen simply as camps for the transient and forfeiting their claim to First Amendment protections. One camp went to extreme measures to make sure people were there for the “right” reasons. After Little Rock, Arkansas, officials told Occupy Little Rock to leave the grounds of the Clinton Presidential Library, they granted the protesters a parking lot where they could camp. To stay in the good graces of the city, the Occupy group began screening prospective campers with an application and probationary period. Camp leadership warned that the police would evict those who didn’t play by the rules. Giving at least a measure of official sanction, as the city of Little Rock did in setting up a designated campground, actually ensured more cooperation with authorities than constant harassment—and a smoother exit when permits expired. Since protesters in D.C.’s Freedom Plaza had obtained permits independent of the Occupy Wall Street movement months in advance, they were more willing to abide by their permits’ terms, moving when the Park Police asked them to to make space for other protests and complying with inspections. The city of Buffalo, New York, initially signed renewable two-month agreements with its occupiers, giving them a clear deadline for when they’d have to leave in advance of previously scheduled events in Niagara Square. Occupy Detroit was given a one-month permit to camp in Grand Circus Park starting on October 13. Protesters asked for a one-week extension so they could clean up after themselves. Then they left of their own accord. Ultimately, even the most sympathetic cities reached a point where the prospect of indefinite occupation was too much to bear—especially in light of pressure from the businesses surrounding the Occupy camps. In Washington, D.C., the NPS avoided confrontation with the unpermitted camp in McPherson Square, content to monitor and contain its effects. But the Downtown D.C. Business Improvement District (BID)—which has worked hard to make this once-seedy downtown attractive to businesspeople and residents—grew increasingly frustrated, according to e-mails obtained by the Washington Post. The NPS wouldn’t reach that line, however, until a Republican-led congressional oversight committee hauled in its director, Jon Jarvis, Honorary ASLA, at the end of January to explain why he hadn’t been enforcing regulations against camping in McPherson Square and Freedom Plaza all along. Despite Jarvis’s contention that the protest was a “24-hour vigil,” not camping, enforcement actions began on a Saturday morning a week and a half later. On January 27, the NPS warned protesters that it would begin to enforce rules against camping on the site at or around noon on January 30. Occupiers would not be required to remove the tents, but they would be required to remove sleeping bags, sheets, and other camping materials and keep the flaps of their tents open. In the early morning hours on February 4, five days after the deadline, police cordoned off sections of the parks and swept through in white bodysuits, methodically bagging up tents and detritus that hadn’t been totally cleaned out. By the end, McPherson Square had become an eerie ghost town, with only about a third of the tents that had been there before. Many cities didn’t have the luxury of allowing occupations to drag on into the winter. In addition to mounting public dissatisfaction, the encampments strained already-strapped municipal budgets, which had to be diverted into additional trash collection and police overtime—from $320,777 at the end of November in a small city like Long Beach, according to a city memo reported by the Long Beach Press-Telegram, to $17 million just in police overtime in New York City, as the New York Police Commissioner Raymond W. Kelly told the city council in mid-March. In Oakland, internal e-mails obtained by the Bay Area News Group show Oakland police officials worrying that they had to divert manpower away from other parts of the city. But that’s not typically the reason that was given for evictions—the message that democracy had just gotten too expensive wouldn’t have gone over well. Instead, authorities said that the occupations were endangering the public’s health and safety. The courts have typically allowed local governments to make reasonable rules that limit where and when people may assemble, as long as the local governments do so in a content-neutral way. Oakland began enforcing a 10:00 p.m. curfew in late October in response to concerns about fire hazards, graffiti, sexual assaults, and a shooting that occurred just feet from the camp. “Over the last week it was apparent that neither the demonstrators nor the city could maintain safe or sanitary conditions or control the ongoing vandalism,” declared a statement from Oakland Mayor Jean Quan’s office. And it’s true: Despite the occupiers’ best efforts, sanitary conditions became hard to maintain at parks that did not have the kinds of toilets or shower facilities found at campgrounds designed to be lived in. Occupations on grass were at a disadvantage, because turf is seen as a public resource, and camping in the same place for a long period of time will kill it. At D.C.’s McPherson Square, the destruction of the turf was especially troublesome: The NPS had just put $400,000 into refurbishing and reseeding McPherson Square’s lawn. In L.A., where protesters dug trenches, damage to the park will also cost around $400,000 to repair, according to an early estimate by L.A.’s city administrator. welcomes all Oaklanders to continue to use the Plaza during daylight hours for peaceful protest,” noted a statement from the mayor’s office after the raid. But once officials had removed the means of protest the occupiers had adopted—the accoutrements of daily life that made a residential community possible—the protest had to adapt to survive. Even if they were still allowed to meet in the park (and in D.C.’s case, even keep tents in the park as a symbolic protest prop), it’s harder to come out to meetings every day if you don’t live there. Occasionally, the rules even changed underneath the occupiers’ feet. In Columbia, South Carolina, the protesters had picked a piece of land owned by the state that had no laws regarding camping. When Republican Governor Nikki Haley set a 6:00 p.m. curfew for the park, a judge granted the occupiers an injunction, given that the rule clearly targeted one group of people. But then, Haley used her authority to rewrite the regulations on a 90-day emergency basis, which effectively put an end to the protest. That’s only one example of local regulations’ being rewritten to strictly confine protests in public space—bans on overnight camping were swiftly instituted in Nashville, Tennessee; Austin, Texas; and Charlotte, North Carolina. Laws that would confine picketing and obstruction of public rights-of-way have been proposed in Georgia and Washington, D.C. The U.S. House of Representatives even responded with an update to an existing law that will make it easier to prosecute people who protest in areas designated as restricted by the Secret Service. It passed 399–3. Some activists have tried to advance an economic justice argument for occupation: They contend that taking up residence is the only way for poor people to protest for long periods of time, as the Bonus Marchers learned, because hotels are expensive and not everyone has friends to stay with. So far, however, the few legal challenges on those grounds haven’t succeeded. The problem for the occupiers is that this is already settled case law. In 1984, when homeless activists camped out on Lafayette Square in front of the White House, the Supreme Court ruled in Clark v. Community for Creative Nonviolence that the act of sleeping itself was “facilitative,” rather than “expressive,” meaning that campgrounds aren’t protected forms of speech at all. Some of the people who were evicted have been successful in their ability to move beyond the inevitable loss of a home base. Occupy groups in Albany and Buffalo, New York; Detroit; and Chicago have all rented offices, from which organizing efforts continue. Occupy Wall Street has organized a series of daylong protests in other parks called “Occupy Town Square.” Occupy Atlanta, after its removal from Woodruff Park in late October, quickly transitioned into occupying houses that had gone into foreclosure and has developed a methodology for pressuring banks to modify the homeowners’ loans that is now being copied all around the country. Now, they meet during the daytime in either Woodruff Park or the regional headquarters of the American Friends Service Committee and have lately been protesting outside AT&T’s headquarters and mobilizing against a bill in the Georgia legislature that would disallow mass picketing in labor disputes. Organizer Tim Franzen sounded almost grateful for the eviction—fighting over regulations governing public space, which has taken up so much time in cities around the country, was never really the point of the Occupy movement. Lydia DePillis is a staff writer at the Washington City Paper in Washington, D.C.., where she covers real estate, development, environmental issues, architecture, public space, and everything in between.